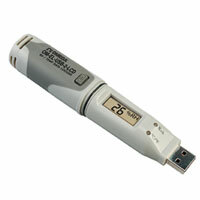 The OM-EL-USB-2-LCD is a standalone data logger that measures and stores up to 16,379 relative humidity and 16,379 temperature readings over 0 to 100% RH and -35 to 80°C measurement ranges. The high contrast LCD can show a variety of temperature and humidity information. The OM-EL-USB-2-LCD-PLUS has the same measurement range and features with an enhanced accuracy specification. At the touch of a button, the user can cycle between the current temperature and humidity, along with the maximum and minimum stored values for temperature and humidity. In addition, logging and alarm status is shown using two high intensity LEDs. The data logger is supplied with a long-life lithium battery, which can typically allow logging for up to 1 year. 12 hrs), high and low alarms, immediate, delayed or push-to-start logging, display off, on for 30 seconds after button press, or permanently on, and data rollover (allows unlimited logging periods by overwriting the oldest data when the memory is full). Downloaded relative humidity, temperature and dew point data saved in text format can be graphed, printed and exported to other applications for further analysis. OM-EL-USB-2-LCD: ±0.5°C typical; ±2.0°C max. Noter: Comes complete with Windows software on CD-ROM, protective cap and 3.6V lithium battery.